Boots Riley is a provocative and prolific poet, rapper, songwriter, producer, screenwriter, director, community organizer, and public speaker. His directorial film debut, Sorry to Bother You, premiered at the 2018 Sundance Film Festival and shook the world when it opened in theatres in July 2018. Never afraid to speak his mind, he is fervently dedicated to social change, deeply involved with the Occupy Oakland movement, and one of the leaders of the activist group The Young Comrades. He is also the lead vocalist of the internationally known musical groups The Coup and Street Sweeper Social Club, as well as the author of the critically acclaimed Tell Homeland Security-We Are the Bomb. It is clear Boots Riley is a distinct, brave, radical, new American voice across mediums—one who is here to stay and keep inciting change. 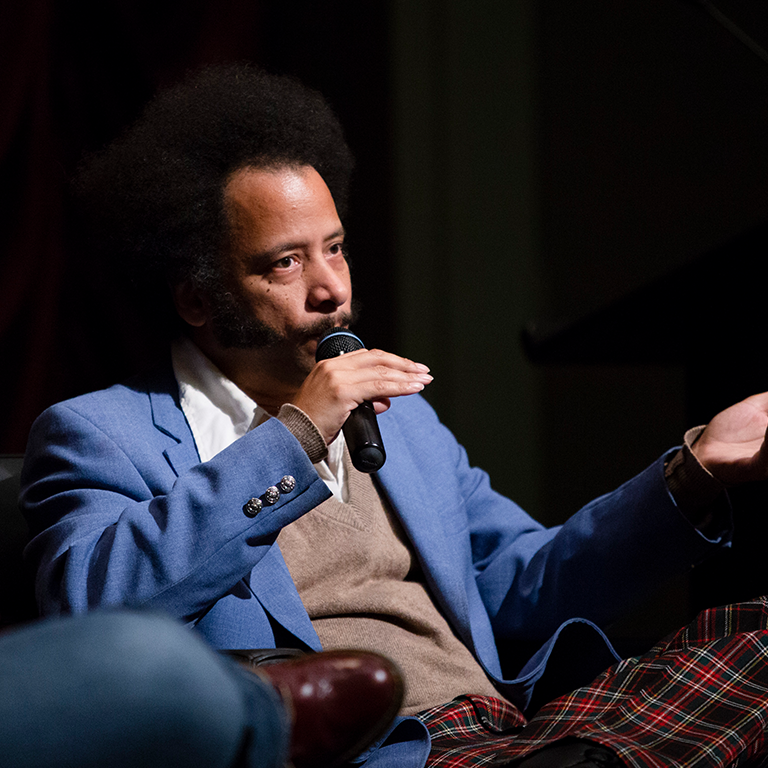 Boots Riley talks on stage during his Jorgensen Guest filmmaker program. A clip of a music video by Boots Riley plays on screen at IU Cinema. Boots Riley posses for a photo in the lobby of IU Cinema.